As critical criticism continues to trail the call by some Northern Youth that Igbos should vacate the North within three months and subsequent support by Spokesman of Northern Elders Forum, Professor Ango Abdullahi, Northern Youth Council of Nigeria (NYCN) has called on the federal government to extend its arrest order to the professor. The group who address world press in Kaduna at wee hours of Saturday noted that, should there be any crisis as a result of uncivil declaration by some reckless youths who failed to weigh the implication of such sensitive matter on the economic and socio-political consequences , Ango Abdullahi and his family will fly out of the country and leave the innocent to pay with their blood. 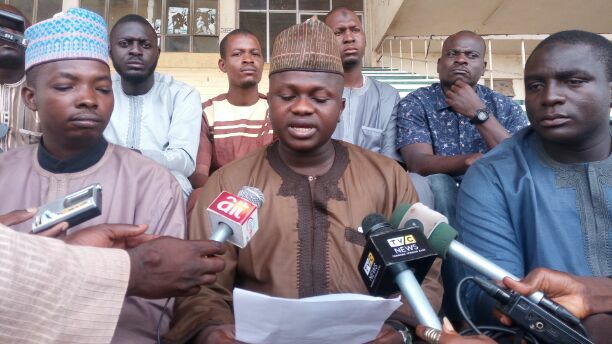 President, NYCN Isah Abubakar said, the Kaduna Declaration’ was never in any way represent the collective voice or decision of any legitimate coalition of youth groups from the region as the council remains the apex youth organization that hikds right to announce any resolution of youths from the region. The group, which plainly dessociated itself from the declaration said Nigeria remain one indivisible entity reiterating that, any Nigerian citizen, has the right to live and own property anywhere he or she chooses to reside without fear from other fellow citizens. Isah, who expressed worry that when the country is working very hard to retrace its step to good governance, some were busy trying to frustrate that effort by well meaning Nigeria especially, President Mohammadu Buhari and his Vice Professor Yemi Osinbajo. To Isah, “telling the Igbos in the Northern States to vacate on or before October 1st 2017 is nothing but display of mental derailment in the public space. “It is important we once again reinform the public that Northern Nigeria remains home for all. “The council has equally resolved to invite its counterpart from the Igbos extract to sign new peace pact tag “peace accord 2017″ on 2nd September 2017 in Abuja to further establish our purposeful readiness to continue the marriage of 1914 and partnership in progressive development of our dear nation Nigeria”. On Ango Abdullahi he said, “we are surprise with statement credited to our renown elder and academic, Professor Ango Abdullahi supporting the uncivil and illegal declaration that Igbos should vacate the North. “NYCN want to use this medium to dissociate itself from anti-Nigeria agenda for selfish reason. We are not happy with the development in all its ramifications. “We are calling on federal government to extend its arrest order to Professor Ango Abdullahi and other people who must have sponsored the perpetrators of such a huge inciting statement capable of throng the country into another civil unrest while the country is yet to fully recovered from the previous one several decades after”. POSTED BY EDITOR (SATURDAY 10-06-2017).